Deadly pro-Russian unrest in eastern Ukraine has created a crisis for the new authorities in Kiev, months after President Viktor Yanukovych was driven out of office. After imposing economic sanctions on Russia over its annexation of the Ukrainian region of Crimea in March, the US and EU are at loggerheads again with Moscow despite diplomatic efforts in Geneva. The crisis has exposed deep divisions in Ukrainian society - between the European-facing west and the Russian-facing east. Explore the maps and graphics below to find out more. 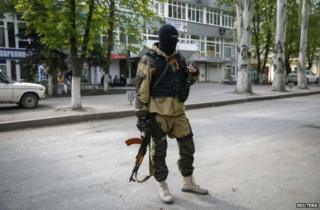 Why is the eastern Ukraine crisis dangerous? Pro-Russian sentiment is strong in regions like Donetsk and Luhansk, Ukraine's industrial heartland and vital to the country's economy, but the population is much more divided in its loyalties to Moscow or Kiev than people were in Crimea. In contrast to Crimea, the revolt in the east has been bloody, with at least six protesters shot dead, and the abduction and killing of at least one pro-Ukrainian politician. Again unlike in Crimea, the Ukrainian government has responded with military force but its early efforts to restore order in protest strongholds got bogged down. Russia has made clear it reserves the right to intervene militarily if its interests are threatened in the region, and has stationed thousands of troops just over the border. Why is Crimea so important? The region, a peninsula on the Black Sea coast of Ukraine, is of political and strategic significance to both Russia and Ukraine. The majority of Crimea's 2.3 million population identify themselves as ethnic Russians and speak Russian - a legacy of Russia's 200-year involvement in the region. Russia's Black Sea Fleet has its historic base in the Crimean coastal city of Sevastopol - a continuing source of tension. After Ukraine gained independence, a leasing agreement was drawn up to allow the fleet to continue operating from there. In 2010, this lease was extended to 2042 in exchange for Russia supplying discounted natural gas. Frictions between Ukraine and Russia escalated dramatically in November last year after the then pro-Moscow President Viktor Yanukovych abandoned an EU deal in favour of stronger ties with Russia. He fled Ukraine in February after violent protests in the country's capital Kiev. Later, Kremlin-backed forces effectively seized control of Crimea and, in a subsequent referendum, the region declared 97% of voters backed joining Russia and leaving Ukraine. What ethnic groups live in Ukraine and Crimea? The divisions within Ukraine go back much further than recent events. The country has been torn between east and west since the collapse of the Soviet Union in 1991 and this is reflected in a cultural and linguistic divide. Russian is widely spoken in parts of the east and south. In some areas, including the Crimean peninsula, it is the main language. In western regions - closer to Europe - Ukrainian is the main language and many of the people identify with Central Europe. This division is to some extent reflected in voting patterns. The areas where a significant proportion of people speak Russian almost exactly match those that voted for Mr Yanukovych, as opposed to his rival and former Ukrainian prime minister Yulia Tymoshenko in 2010. Crimea is particularly Russian-facing in terms of its language and ethnicity. According to the 2001 Ukraine census, while most Ukrainians identified themselves as Ukrainian, most residents of Crimea identified themselves as ethnic Russians. The census also showed that while most of Ukraine's population said they regarded Ukrainian as their native language, most of those in Crimea said their native language was Russian. However, there are still large populations of ethnic Ukrainians and Tartars. Many ethnic Ukrainians have natural loyalties to Kiev, while many of Crimea's indigenous Tatar community - deported in large numbers by Soviet leader Joseph Stalin in 1944 after some collaborated with the Nazis - boycotted the referendum. Some have also expressed fear at being once again under Moscow's rule. What ties does Ukraine have with Russia and the EU? Ukraine has economic ties to both the EU and Russia. Russian gas pipelines to Europe pass through Ukraine - a fact made abundantly clear in 2006 when Russia briefly cut supplies, sparking alarm in Western Europe. Ukraine imports most of its oil from Russia - although recent discoveries of shale gas in the country mean it may become less dependent on Russian supplies in future. There are also oil and gas fields in the Black Sea, which the government in Kiev had hoped to be able to exploit in order to further reduce its dependence on Russian imports. Crimea's main water supply comes through Ukraine. The region's climate is dry and warm and most of its rivers and streams dry up in summer, so most of its water supplies come from the Dnieper river via the North Crimean Canal. The high-level meeting, the first of its kind in two years, comes as relations remain tense. Could the Calais Jungle grow back? How does Trump's schedule compare to other presidents? Donald Trump would not be the first president to forgo a nine-to-five routine. Has Beijing's air quality improved?